Izak Adizes, in his 1988 book, Corporate Lifecycles, chronicles the life stages of the entrepreneurial organization as it travels from infancy to death. 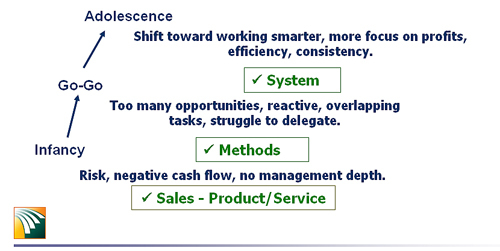 In each stage, Adizes describes what is required for the organization to move forward (to the next level). 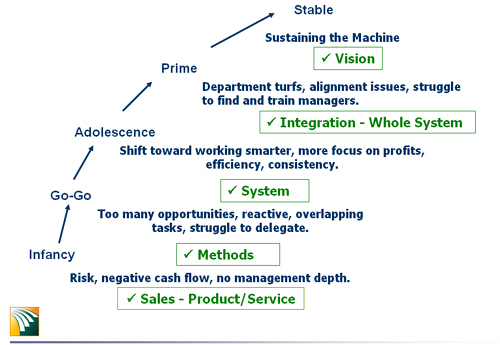 That management struggle in each stage has a striking correlation to each of the layers in Elliott’s model. For this struggling organization to survive, it has to focus on one very specific thing. Sales. It has to get its product or service established into the market. It has to prove its concept, that the market finds its product or service valuable. Understand that, in the beginning, these sales don’t even have to be profitable. This is proof of concept and the entrepreneur is going to hang all the expenses on a credit card anyway. If the organization survives, proves its concept in the market, it has the opportunity to grow. Yet it is still finding its way. Every corner turns on opportunity and the business model is not mature enough to realize its focus, or even the need for focus. The Go-Go organization sees everything as an opportunity. Their meager success fuels the bravado of invincibility. It is, as likely, they will venture into real estate as to enter the shoe business. As the entrepreneur, Mom and Pop are also faced with a deep struggle. Their fleeting fame and fortune has been built on an internal sense of performance standards. Mom and Pop live and breathe these standards, yet they are no longer doing the work. As more people are brought inside the organization, these standards must be clearly communicated and methods consistently trained. This is a time of peril. The organization must do one specific thing to survive to the next level. They have to meticulously define and document their methods and processes. Adizes describes a dramatic shift at this stage. The game is no longer proof-of-concept. The game now turns to profitability. The seed money is long gone and the bank line of credit is creeping. To maintain its life force, the organization must focus on efficiency. Discipline and accountability become the watchwords of the day. The organization that does it right, has taken its well-defined methods and processes and sequenced them into coherent and efficient systems. It is systems that define profit margin. It is systems that allows the existence of price schedules or estimating methodologies. 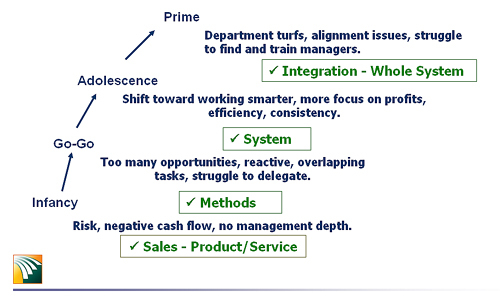 It is systems that drive predictability into the product or service. 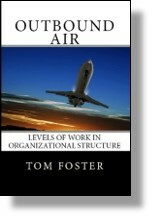 Management’s imperative is that each part of the company become efficient. This mandate for efficiency forces each department to focus internally. No waste, reduced scrap rates, high capacity utilization. With this focus on efficiency, we breed departmental turf wars, hidden agendas, politics and outright cat fights. At the same time the company grows, not all of its members, management included, grow with it. Some people are left behind and there is a struggle to find and train new managers. Those managers who do rise to the occasion and move up to the plate, leave behind management voids that must also be filled. For this organization to survive, it must do one very specific thing. It must integrate its systems together into a whole system. At the top of Adizes’ Lifecycle curve is the Stable organization. Its largest difficulty is simply sustaining its success. When you are at the top, there is only one way to go. Maintaining its position to remain viable in the market, is the Stable organization’s challenge. To maintain viability, it must constantly be looking forward, creating a clear and compelling vision of the future, relevant to its market.